My thesis for this post is pretty simple, Ghana with its myriad of issues (just like every other developing nation), has done a fairly decent job at improving the Primary Education Access to its citizens over the last six decades. Especially considering the fact that, many of the countries in the Sub-region and on the Continent, have not been able to achieve this feat. Of course there is always room for improvement, resources are limited and quality remains a relative measure of value delivered, etc. etc. But none of these caveats negates the fact, that Ghana still remains a key player in the African and Global Education arena. 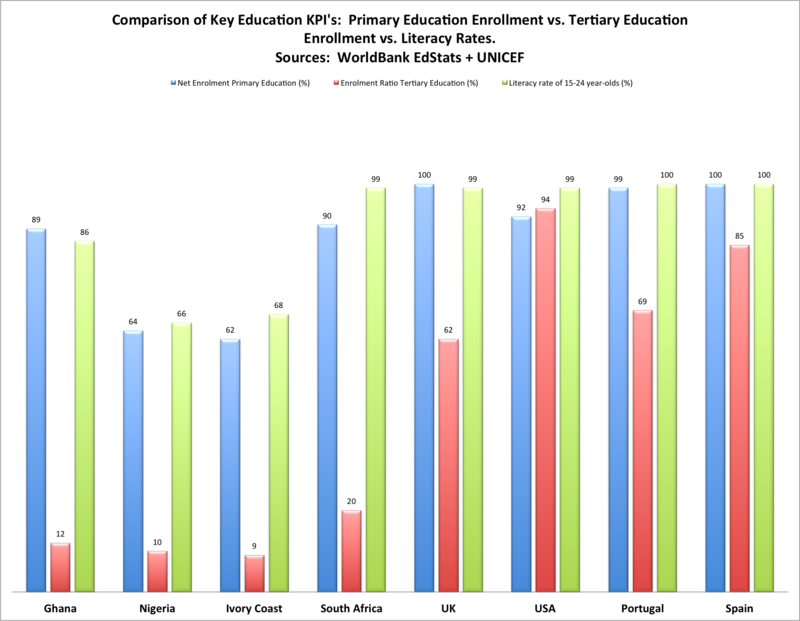 And since this post was originally triggered by the debate and confusion that Susanna Rustin’s article in the Guardian, I went a step further to also compile a quick comparative data table of a few key education KPI’s such as Literacy rates, Primary School Graduation Rates, etc. Primary education is critical to the intellectual development of every individual. Since this is the stage where most people begin to develop their literacy skills. According to UNICEF’s Quality Primary Education Report, “In addition to being a right, basic primary education underpins the success of a society. Every year of primary education increases a person’s productivity and reduces their dependence on social resources. The goal of education is to enable children to learn, realize their full potential, and participate meaningfully in society. In spite of increasing enrollment rates, too many children are learning far less than what they are taught about or what they ought to learn in school. This low learning achievement is most frequently due to a combination of factors that include inadequate learning environments, inappropriate teaching methods and frequently unmotivated teachers, and the malnourishment and ill-health of children themselves. Educating children no matter where they are is one of the biggest steps we can take toward ending extreme poverty. Education is key to building a society that can overcome poverty in a sustainable manner. Investing in human capital brings about powerful social change and creates opportunities for those in developing countries to realize their full potential and to become leaders of the generation to come. 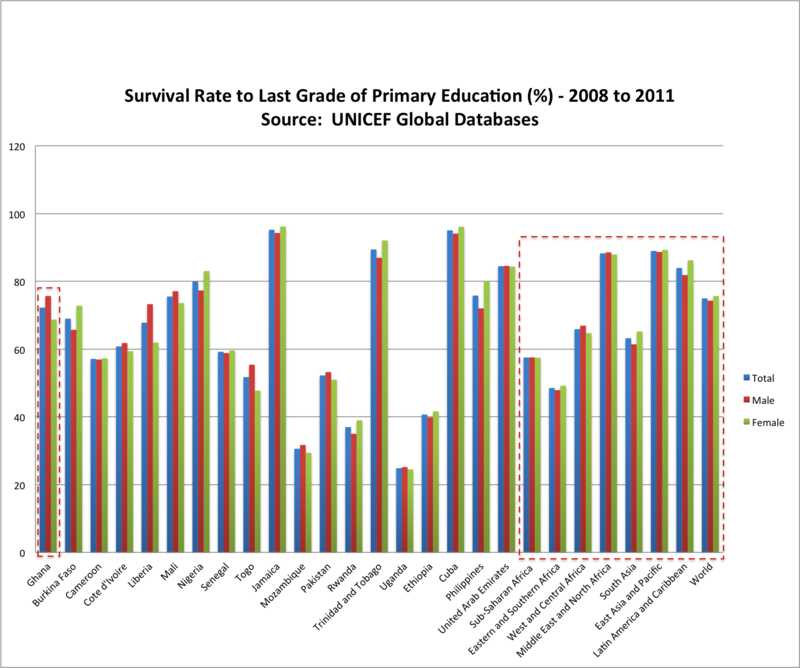 A critical review of Ghana’s primary school education performance is revealing. When compared side by side with many of its compatriot’s in the sub-region as whole, it becomes immediately apparent that, Ghana’s performance, relative to its peers is credible and respectable. 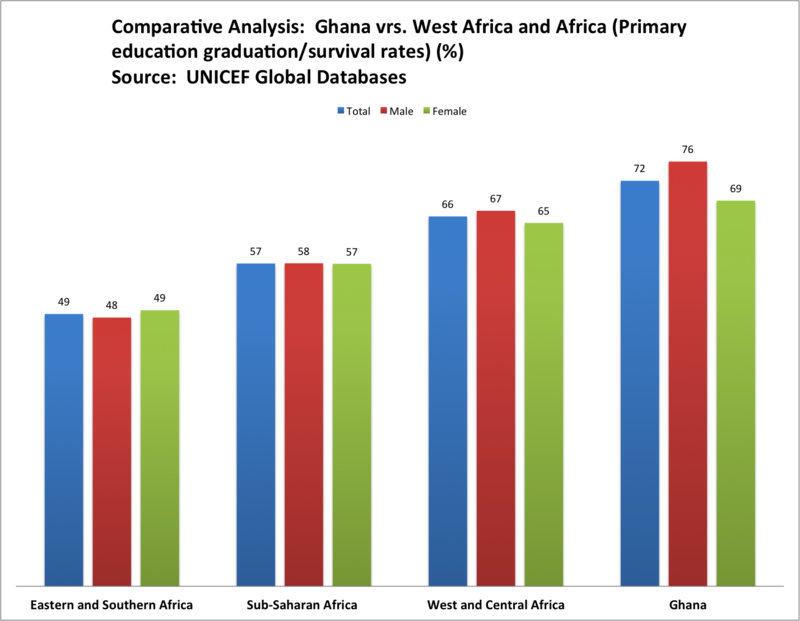 With the exception of Nigeria and South Africa, Ghana seems to comfortably outperform the majority of his regional and continental peers when it comes to Primary Education graduation and participation rates. KPI/Metric Definition: Survival rate to last primary grade – Percentage of children entering the first grade of primary school who eventually reach the last grade of primary school. Ghana’s continental strong performance aside, the minute you begin to compare her performance to that of other continents such as Asia, Latin America and the Caribbean, etc. Ghana all of a sudden, almost falls to the bottom. The only sub-region that Ghana outperforms is South Asia. Adult literacy rate: Percentage of person’s aged 15 and over who can read and write. Gross primary or secondary school enrolment ratio: The number of children enrolled in a level (primary or secondary), regardless of age, divided by the population of the age group that officially corresponds to the same level. Once you begin to analyze the ratios of enrollment and literacy, suddenly Ghana begins to emerge as an educational powerhouse on the continent. South Africa’s ninety percent rate is only one percent point higher than that of Ghana’s. And once you factor in the respective GDP’s and Per Capita of countries like Nigeria, SA, Ivory Coast; and you quickly realize that on both a continental and global level, Ghana is actually performing quite well, considering the circumstances. Learning begins at birth. The early years, defined as from zero to age eight, are the foundation for lifelong learning. Early Childhood Development (ECD) programs provide the essential base for the achievement of all Education For All (EFA) goals and contribute powerfully to reducing poverty, the overarching objective of the MDGs (Millennium Development Goals), and to achieving social justice. Costly wastage in both financial and human terms can be avoided by investments in good quality early primary education combined with quality early childhood services prior to children entering school. This improves the efficiency of the schooling system and saves money by reducing repetition and drop-out and improving completion rates and achievement, especially for girls and marginalized groups. The real systemic failure in education is in early primary – yet it receives almost no attention. The emphasis on completion of primary has distracted attention from the heart of the problem – the fact that it is in the first two years of school that the majority of drop-out occurs. Many of those who continue in school end up in persistent patterns of underachievement and leave school unable to read fluently or calculate, let alone problem solve and think critically. The earliest grades are often taught by the least experienced and trained teacher, have the largest class sizes, fewest hours of learning per week and few if no materials. Schools must be ready for all children, whether or not they have had the opportunity to participate in an early childhood programme and are ready for school. 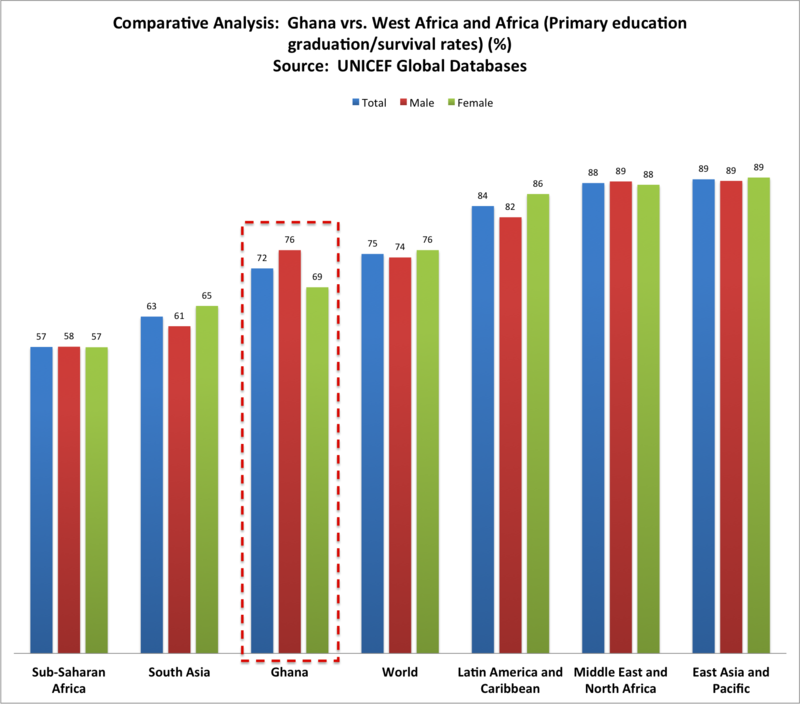 The statement that Ghana has an almost 90% primary education enrollment rate is factually accurate (at least according to WorldBank, et al)!! But of course, as in almost any government entity, there remains a lot of room for improvement. Especially in the areas of quality analysis and measurement and delivery optimization. I was hoping to be able to extrapolate some Quality and Outcomes related data from the Edstat database in order for us to get to analyze the Access/quantity argument against the education quality imperatives. But unfortunately most of the countries do not provide this data (or at least not consistently). Hopefully in the future I can find the time and funding to delve into the Education Quality angle of the argument in greater detail.